Yesterday afternoon, I attended a lecture at the very beautiful John Rylands Library in Manchester by academic and Chinese art world colleague Professor Craig Clunas from the University of Oxford. 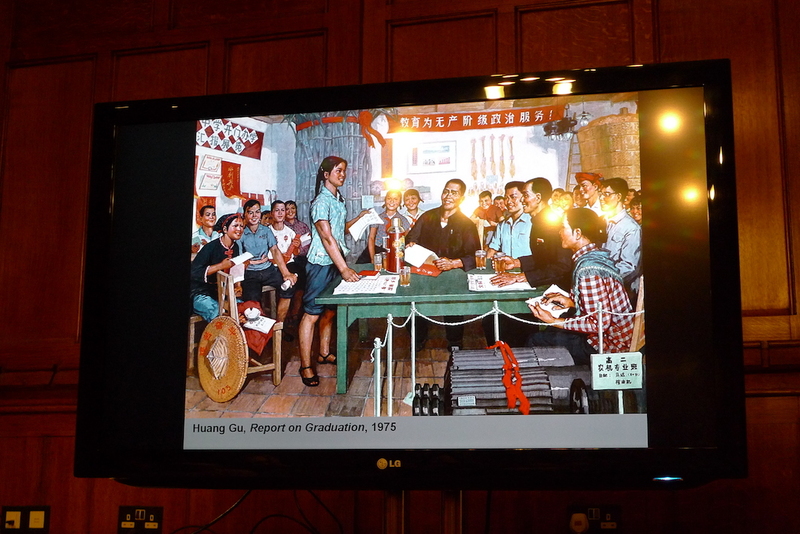 He was speaking on ‘Metadocuments – Writing on and Writing in Modern Chinese Painting’, a paper he was also to present at the V&A’s conference on ‘The Making of Chinese Painting’ at the end of last year…however, they ran out of time. Here is a brief overview and record of some of the thoughts from the session. Clunas discussed the relationship between text and image, word and image, as characterised in Chinese art…a topic that I actually wrote about in relation to Western art for my undergraduate thesis, and that as a research area has stayed with me to today…so I was very interested to hear his paper. Referencing the pictorial writing systems in Chinese painting, where only a few function as iconic signs in semantic term, he discussed how inscriptions on paintings force/hold attention to the surfaces, subverting any risk of the painting being a realistic window onto the world…an attempt to understand the interplay of the image with the words of the poetry. Chinese painting can be examined in terms of pre-modern and post-modern, and since the reforms of the 1980s…the manipulation of the text in relation to the image is a powerful form of post-modern practice such as through the work of Huang Yongping ‘A History of Chinese Painting’; Xu Bing’s ‘A Book from the Sky’, ‘Cultural Animals’ and ‘Art for the People’; Qiu Zhijie and Gu Wenda ‘United Nation Series’. The Chinese character offered appropriation, manipulation and rejection…the intense negotiation of China’s heritage is the focus of many contemporary artists…image and text, subject and reading, the other and self…the prominence of the word as essential to the understanding of Chinese art. There are stressed points of difference and downplayed points of similarity…reductive single features. Artists who wished to use inscription – to be both Chinese and modern…techniques of inscription seen as traditional rather than modern, including signatures – to sign in one script or another would subvert a project…the conundrum of either Chinese or modern. A disconnect between foreground and background…seen in 1910s/1920s…formed by meta-paintings (images within images) representative of internal struggles as the debate within painting at that time. Double signature representative of dual heritage…a practice of the double signature, a more powerful acting out of the tensions and conflicts which affect the pictorial field during those years prior to 1949. An ambiguity and uncertainty towards clarity…this traditional aspect is folded within the modernity that the state embodies…”stylistic Orientalism”…individualising inscriptions, graphical elements, completely recognisable…late Cultural Revolution period largely over by 1970…and as part of Communist party discourse 1966-1976. Text present within propaganda paintings. Seen as “bad art” and “bad objects” that can be instructive too…must pay attention to what we might call “bad objects” the objects of the other, not just bad in the moral sense but in ambivalence and anxiety. Much Chinese Painting contains writing within it, within the pictorial field. Clear iconographic signs of identity and socialist construction for example ‘Report on Graduation’ (1975) by Huang Gu (shown below). Clunas references Roland Barthes notion of “bricks”…”bricks” of language and super-realism. Repetition seen as draining of significance. Super-realism – embalm it in appearances the social stress and trauma, the highly unpopular formula of forced migration…a repression of the real. “bad art” laced with “bricks” of language & super-realism embalm it in appearances the social stress & trauma. Writing on the picture, writing in the picture, what about writing behind the picture? “No Name” group of painters, sharing their work only with each other and below the party state. In the mid-1970s, Zhao Wenliang’s inscription on the rear of the painting ‘August 18, 1966’ (1966). A sense of temporality as much with spatiality…ruptures with past practice, describing the reverse of the painting practice. There is a picture, there is writing, and they relate to each other neither in the way of the pre-modern (this is not real this is picture) or the Mao “metadocument” (this is not a picture, it is real)…in this instance they cannot be seen at the same time. We can only see one or the other. Neither the image or the text repeat (which Barthes saw as liberating)…options of writing on or int he painting may not have been the Chinese artists options, just as Chinese or Western may be the only options. There are further possibilities…. In the closing Q&A a member of the audience highlighted that Chinese painting is not always local-centric. In Chinese philosophy there is an alternative method of Xi’an (?) mode of thinking in the I Ching, like a map…language itself has limitations, so you have to go beyond the logo or the word to apprehend more aspects of reality where you don’t need words. Chinese painting always tries to combine both. Exhaust as much of reality as possible. It believes in what is “virtue ethics”…not written about in the West. How do you teach virtue ethics? It has been taught through models…social and moral values by certain stories. Clunas: Is there a moment of rupture in the Twentieth Century? A return to a pre-modern understanding of the image? I will stick to my point of view, they are not words inside the picture, it is not like a colophon on the image which is about drawing our attention to a window into a world. It was also questioned as to whether many of the painters are seen as illustrations…’illustrations to inspire a moral responses. There is a disconnect in calligraphy and writing…calligraphic practice often falls into the anecdotal…it is curious that there’s never any sense, that there’s no debate about calligraphy…”logo-centricity”…it’s like it’s a fact, it doesn’t carry elite culture that other pictorial forms do.